Pictured here is a hand painted example of a Weequay hardcopy. 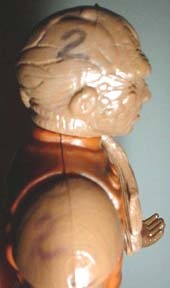 Painted hardcopies like this one, known as paint masters, would have been used for a variety of purposes including photography, samples for trade shows like Toy Fair, or examples of color scheme for foreign vendors. If you look at the second photo you can see that this hardcopy is held together by metal pins and was made using green Dynacast, which became the post-1982 standard for hardcopies. 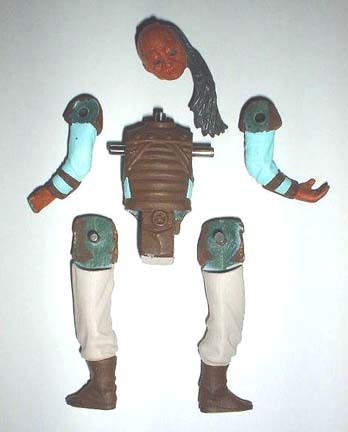 At first glance this may appear to be a rather boring, unpainted, first shot of Weequay. There are a few things that make this first shot a little more interesting though. 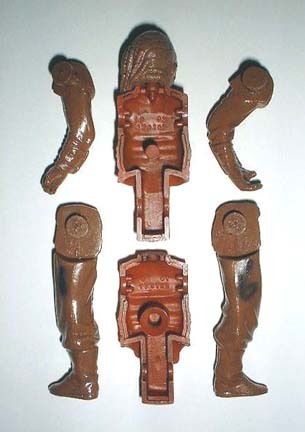 For instance, besides the fact that the figure lacks copyrights it has also never been sonic-welded. Also, perhaps the interesting thing about this first shot you'll see pictured below. 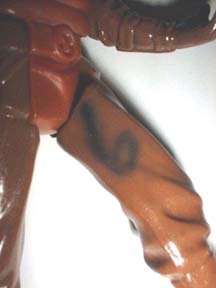 Here are close-ups of numbers written on each of the limbs. I've seen this before on first shots, and it does add an interesting aspect, but the reasoning behind it is still a mystery. This is another first shot, only this time it is only the head and torso. There are quite a few combinations like this floating around. 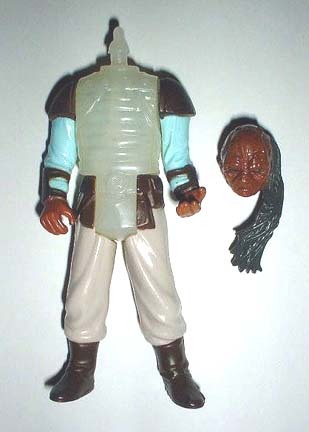 These head/ torso combos were used to test how easily the heads would pull off. The limbs are production and have been added for display purposes. The torso is unpainted, has never been sonic-welded, and is shot in milky white plastic. The head has obviously never been attached. This shot is of the POFT2 Weequay. 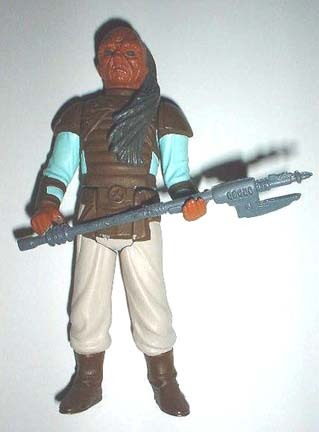 In this series Tracey has an unpainted first shot with weapons, all in non-production colors, a "paint deco sample", and finally a production figure. Note the difference in paint scheme between the paint sample (middle) and the production piece (right). Tracey is unsure of the material used for the paint sample but it is possible that it was shot in a different type of resin (non-injection molded) because he is noticeably bigger than the production figure, as a hard copy would be. I have also encountered modern first shots that are a bit larger than a productions figure and are made of a very brittle plastic that must not shrink as much when cooled. Finally here is a shot of the entire series that Tracey has managed to put together. This is no easy feat and it's great to see what Tracey's hard work has accomplished.